Is there a Lions club which does not run a Christmas float? We don't know of one. At Wellesbourne we run two. December 2018 saw us make 22 sorties to most of the nearby villages, collecting on behalf of local charities, organisations and groups. Each one sent volunteers out on every evening to assist with the collection and they really made an enormous difference. This year we had heavy rain to deal with on one night. We still braved the elements to make sure we visited the children who wanted to see Santa. When we had determined the amount to be distributed, we invited everyone to a quiz and cheques presentation night at Kineton Village hall where we have a lot of light hearted fun. The picture below shows a full house. Our Easter Eggs for this year have been delivered and will be in an outlet near you soon. 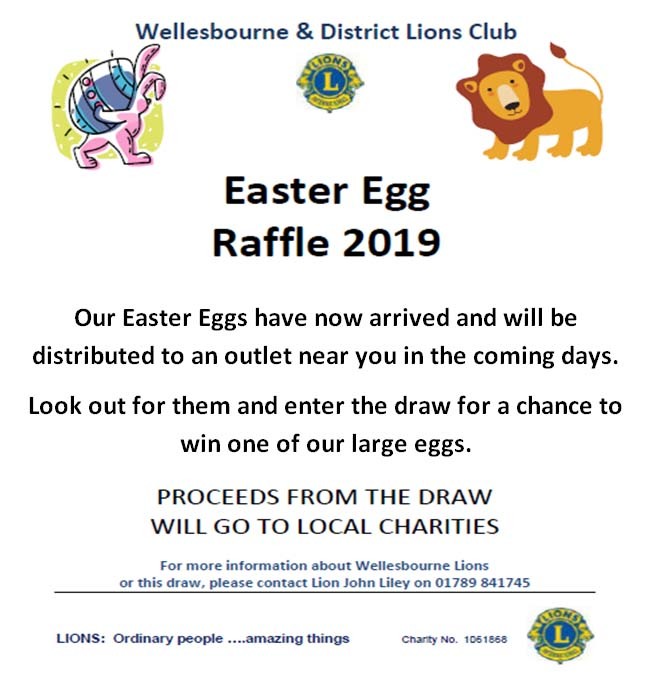 We have a couple of spare eggs at the moment, if you know of an outlet that would like to raffle one for us, let us know by using the "Contact us" link below. If you remember the good old 1960's then you'll probably like to come along to our Sixties Revival Night. 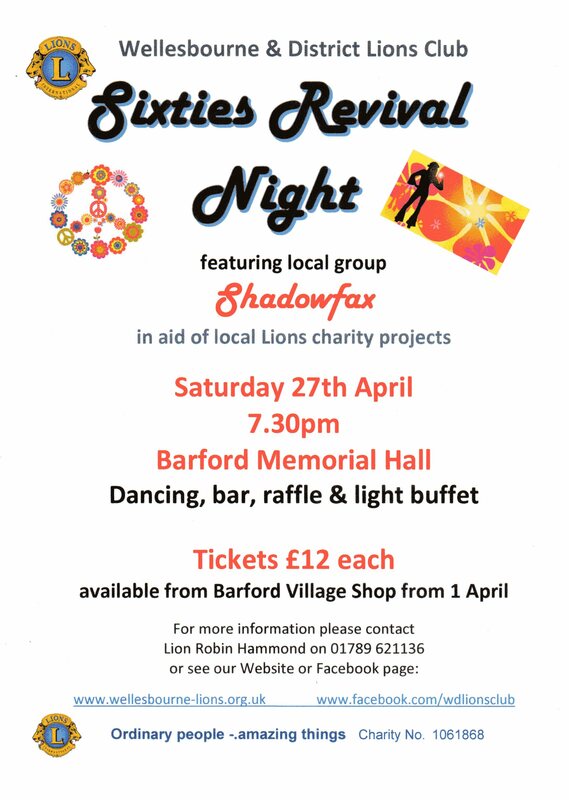 This will be held at the Barford Memorial Hall on the 27th April from 7:30PM. There will be a Bar, a light buffet will be served and we will be holding a raffle. All money raised will be in aid of local Lions charity projects. If you'd like tickets look up the contacts on the poster below, or let us know by using the "Contact us" link below. Your request will be forwarded on to the organising Lion. Many of you may not know, but the Raft Race in 2017 was our last one. A number of circumstances, which were out of our control, have stacked up against us and we had to decide to stop doing it. It's something we have done for over 40 years and we're sad to stop it, but we didn't really have much choice. Have you ever been Lion Racing? No? Well now is your chance. We have all the kit ready to run a "Lion Racing" event we just need somewhere to do one. If you'd like to set up an event for your Charity or Organisation and you'd like us to run Lion racing for you, let us know. Write to us using the "Contact Us" link and we'll be in touch. Traditional fund raising methods continue to be a good source of income and require a more limited resource than the Raft Race or Christmas floats. It is also good for PR because we are seen out and about in the community and useful relationships can be built. We also join our neighbours in Stratford-upon-Avon (Shakespeare Lions) for joint fundraising events. Additionally, visibility within the community can aid recruitment of new members which is something that always needs addressing.